I spent two days in Puebla, about two hours by bus from Mexico City. I fell in love with the city and its varied architecture with incredible tilework and its friendly vibrant vibe. I will be back someday! Why Puebla? I decided to stop in Puebla for two reasons. First, a large part of the New York City Mexican population descends from Puebla and I often try to visit the locations where immigrants around me are from. Also, over the summer I met two street artists from Puebla and they told me that Puebla was known for great street art. Both turned out to be great reasons to go there! Check out my pictures and you'll see why! So perhaps you remember me posting a clip about a town in Mexico that painted a neighborhood? You may not have taken me seriously when I said I had found my next travel destinaton. I'm not sure I was serious, but, look, I went there! And it was beautiful! Pachuca, Mexico is hoping a psychedelic mural can cement the transformation of a once crime-stricken neighborhood to a safer, more unified community. The government-sponsored urban renewal project, called El Macro Mural Barrio de Palmitas, coated over 200 hillside dwellings in a vibrant layer of paint with striking results. After reading THIS ARTICLE about the painting project in the Guardian, I decided I had to see it first hand. I may have missed annual Mexico City Alebrije Parade, but luckily these fantastic creations lined one of the main avenues for a week so people could enjoy them. The monumental alebrijes of the parade are based on traditional Mexican folk art. They generally combine elements of real and fantastic animals as well as humans including faces, wings, horns, hoofs, multiple heads, tails and more. No two alebrijes are exactly alike. 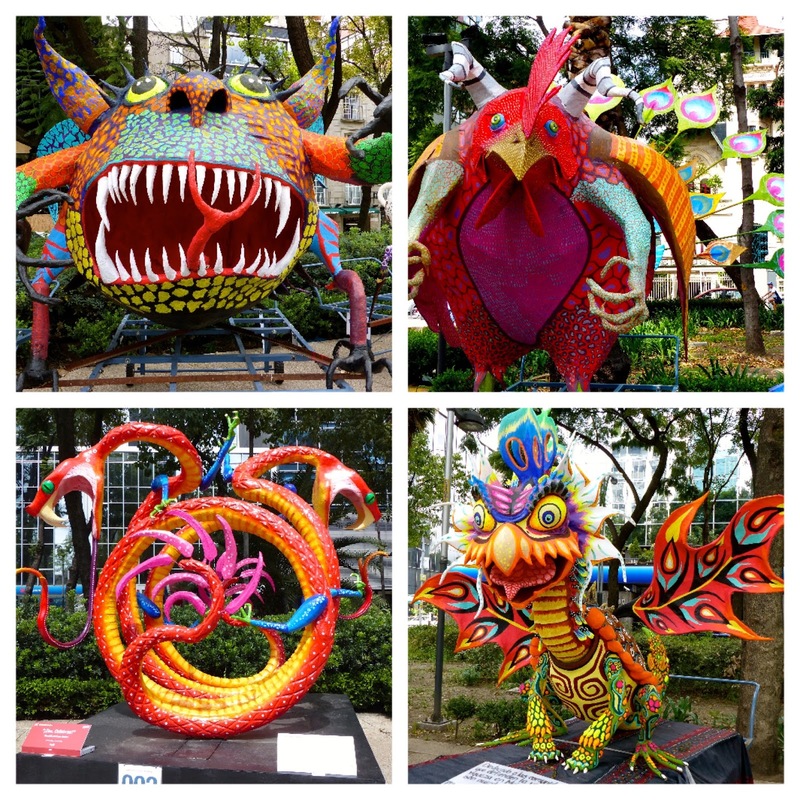 These alebrijes are giant representations of the art which are typically much smaller in size.